In what may very well be Clint Eastwood’s directorial swan song, we see him adapt the true life story of the world’s oldest, and most prolific drug mule. After a career that spans decades, and several massive ages for cinema – will this be a fitting (potential) end? 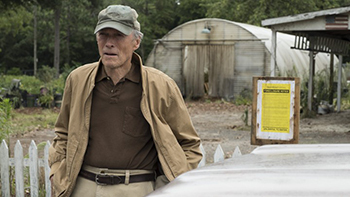 The Mule is the latest, and potentially last, film that Clint Eastwood has directed, produced and of course, starred in. It tells the story of Leo Sharp, based on the book ‘The Sinaloa Cartel’s 90 Year Old Drug Mule’. Leo Sharp himself was indeed a real drug mule, for the aforementioned cartel. He avoided capture for a decade, having only signed up to stop the collapse of his flower business. He was subsequently arrested and imprisoned by DEA agent Jeff Moore. Eastwood plays the role of Earl Stone in this adaption, himself being a horticulturalist like Sharpe. Filling the part of the DEA agent Moore is the ubiquitous Bradley Cooper, himself named Colin Bates, for the sake of adaptation. Those familiar with Eastwood’s work may also be somewhat confused to see such an A-Lister (aside from himself of course) starring in his film. However, the list doesn’t end here. Playing the parts of DEA agents as well, we also see Michael Pena, Laurence Fishburne and furthering the cast as a cartel boss and his ex-wife respectively are Andy Garcia and Dianne Wiest. This isn’t to say this detracts from the quality of the film, but having such recognisable faces can make it a bit jarring in a film that paces itself at that of real life. Without additional ‘Hollywood’ effects and a more typical cinematic feel, it can make suspension of disbelief a little harder. Eastwood himself however, is on spectacular form as ever. Playing the role of a battle-scarred Korean war veteran, estranged from his family with a penchant for casual racism comes naturally to him. This doesn’t make him a carbon copy of Walt Kowalski from his previous film, Gran Torino, although on paper it can easily be read as such. That said, one similarity that shouldn’t really apply to the two films is present. Despite the difference in casting (relatively unknown Hmong-American actors in Gran Torino and A-Listers in The Mule), Eastwood’s charisma and ability on screen is what carries the film. He may have more experience with films of this pace, and that may be what can cause the film to stutter at points. But due to Eastwood’s lynchpin nature, like the film’s namesake, it stubbornly holds on. This is no action film, and to be honest, if you’ve seen a trailer, you shouldn’t go in expecting it. What you can expect from the film, is a gritty, slow burning tale of a man nearing the end of his life. There’s excellent use of silence as well as minimal and atmospheric noise; as you might expect whilst following the story of a man who drives miles alone – albeit hauling several hundred kilograms of cocaine. The cinematography too, is deserving of praise for its simple, dark, moody and atmospheric shots – ones that mirror the entire tone of the film. Viewing the film as less of a microcosm of just the life of Earl Stone however, the film could also be viewed as a criticism of the limitations of the American Dream. Work hard, get rewarded – not so much as the 90 year old war veteran watches his own version crumble, and he resorts to the darker, criminal side to cling to what he can of his life. Although not being totally free of stumbling blocks that can cause the film to stall and swerve a little unexpectedly at points – it’s still a good film from Eastwood. This is particularly true if we judge the film solely on direction and the central character, both of which are deftly done by the man himself.